As part of my work, I once accompanied a prominent visiting American journalist to interview an Iranian MP (who was later to become minister of information). At the end of the interview, the MP offered an invitation: please come to my house. The journalist, who had been told that the best way to learn about Iranian politics was to be welcomed into peoples homes, accepted with enthusiasm. But the truth was that the MP did not really mean to invite us to his home. Like many Iranians in similar situations, by trying to be polite he was attempting to show the extent of Iranian hospitality. He was, in fact, displaying taarof. I had to intervene and explain to my American friend that the invitation was not real; I told him that he should thank the MP and accept the invitation only if it was insisted upon - in other words, if the taarof became more serious. But the MP did not insist. Taarof is an aspect of routine cultural behaviour among Iranians, used in their daily interactions with old and new acquaintances alike. It is a hollow system of flattery and false modesty to make others feel good; often, a practice of polite dissembling, where people express nice sentiments that they do not truly mean or feel. Iranians are not offended by taarof. In fact, a person who fails to engage in the system of taarof stands out as a person unfamiliar with Iranian culture and traditions. Taarof governs different aspects of social life. It may come into play when a host offers food to the guest. The system of taarof may demand that the guest declines politely, another form of taarof, waiting for the host to say taarof nakonid, which might be rendered as an emollient dont do taarof. The exchange of taarof over this simple matter can go on for a long time. Taarof can be very tricky. A friend of mine recalls that he once took a foreign friend on a shopping expedition and momentarily left him alone in a shop while he parked his car. As he returned to the shop, he saw the foreigner being followed by the shopkeeper who was shouting and pointing: thief, get the thief! The shocked foreign friend explained that he had asked the shopkeeper for the price of a cap he wanted to buy, and the man had replied: be my guest. He had not realised that the offer was just a taarof. Indeed, offering something to ones companion is a common taarof. 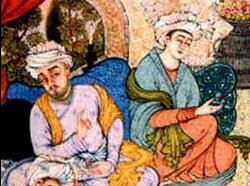 If a person takes the item, Iranians say taarof amad nayamad dareh (one may fall for the taarof and accept your offer.) But if the person who has offered the item changes his mind about handing it over, he may tell the other that it was just a taarof shabdolazimi (a fake taarof). A famous expression highlights Iranians keen awareness of the layers of meaning the word can convey, including a duplicity in their own behaviour: ze taarof kam kon va bar mablagh afza (reduce from taarof and add to the quality). When people go out of their way to perform taarof, the phrase suggests, they not only drive others crazy, but evoke suspicion that their flattery is merely based on hypocrisy. Taarof, in short, is an inescapable part of the patterns of courtesy, deference and consideration for others that are integral to Iranians social life. The following joke reveals not taarof exactly, but something of the shared culture out of which it flows. Some years ago, a woman in a remote village went to see the doctor. She had been expecting a baby, but the baby was a month overdue and there was no sign of its arrival. The doctor pondered, and advised her to wait. A month later, she went back to see him. She was really worried by this time. The doctor sighed, and said: this is a puzzling case  I think youd better go to Tehran to see a specialist. After a long bus journey, with lots of bumps but no signs of life from inside, she arrived in Tehran where a gynaecologist at a maternity hospital inspected her. We need to X-ray you, the doctor said.